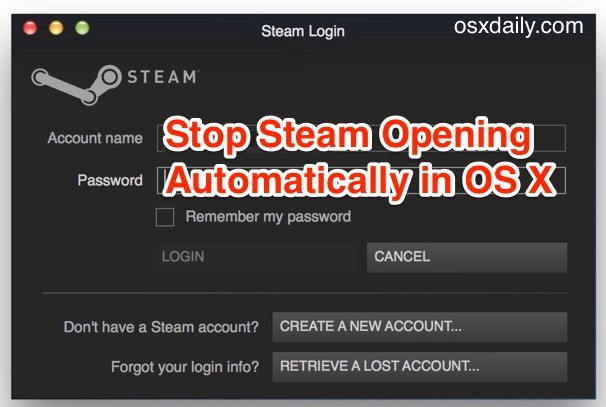 Steam offers many great games for Mac users to enjoy, but if you’re a casual gamer you may not be too excited about having the Steam client open itself automatically when logging in or starting up OS X. Fortunately, if Steam opening itself bothers you, it’s very easy to stop this behavior and only open Steam app when you want to on the Mac. Do note that Steam has an option toggle buried in it’s settings somewhere to adjust this behavior, but the easiest way to just stop Steam launching itself in OS X is to turn it off from the System Preferences panel, which is what we’ll show here. 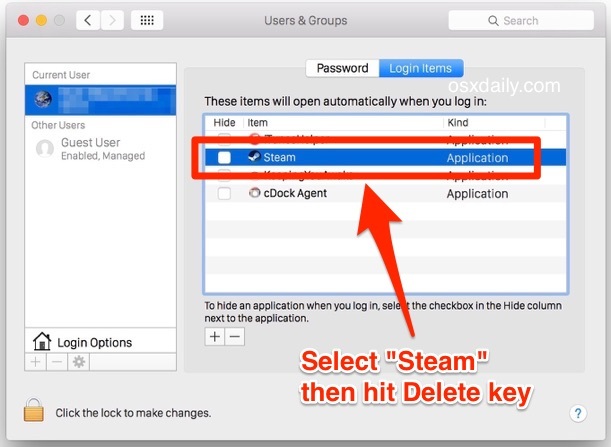 The simplest way to prevent auto-launching of Steam app is to remove it from the Login Items app list of OS X, this is set at a user level, meaning if you have multiple user accounts on a Mac you’d need to repeat this same process for each user on that Mac. The next time you log into that user account or reboot the Mac, Steam will no longer open itself. Instead, if you want to launch the Steam client, you’ll need to open it yourself from the /Applications/ folder, like any other app launched the usual way. Many applications in OS X attempt to automatically load like this on login, Skype is another common example of an auto-starting app that can be managed the same way through Login Items. Some other apps will attempt to load when a device is connected too, like Photos app opening when an iPhone or camera memory card is attached to the Mac. While this can be helpful, it can also slow down the perceived boot time of a Mac because all of these apps must launch before you’re able to use the computers resources, which is why removing these items can help boost the speed of a reboot or startup of any Mac. If you see a lot of other apps in that list, particularly ones you don’t really need to use immediately at boot, consider removing them as well from the Login Items list of OS X.
I like the games Steam has, and the cross platform aspect, but I don’t like Steam as an application, it’s kind of bloated. They should just plain let the OS use its ordinary icons instead of manually reproducing them. Ditto for window behaviour; as installed on my machine under 10.12.2, the Steam window could only be resized from the bottom-right corner when it could be resized at all — having made the mistake of pressing maximise once, it grew to the same size as the screen but placed itself into the wrong location (not allowing for my decision to set the menu bar as autohiding) and can still be moved but can no longer be resized by any mechanism. If they were just letting the OS do what it inherently does rather than trying to save themselves from having to expend any effort whatsoever on the Mac, it’d have the native buttons, resize on all sides, maximise to a separate space, etc. Personally I’d like to see Valve come up with a way for Steam to run in the menu bar similar to how it’s implemented on Windows. The Steam application would still be running at login and start-up, but minimize it into a menu bar option. In this case it is just stopping the automatic launching of the application, because rarely is it appropriate to play games immediately on system boot and to always have a game engine running in the background, particularly if you’re trying to do work on the Mac. What I’ve always wondered is why Steam re-creates two launchctl listings in addition to a “steamclean” plist in the launch agents folder every time the Steam app is run. And what does “steamclean” do ?? Why are you telling users to remove the steam login item using the System Preferences in OS X, instead of using the preferences *within steam*?? It’s trivial to open the preferences in steam, view the Interface options and uncheck the box adjacent to ‘Run Steam when my computer starts’…. I’ve removed it from my login items, start steam when the computer starts is not checked in the preferences, and the damn program still starts every time I login. HOW DO I KILL IT?! Same. What is going on? In Steam, go to the main menu Steam > Preferences > Interface tab > ‘Start Steam when I start my computer’ option and uncheck it. Weird article. Makes you wonder if it is outdated or the writer just assumed it would work like this. I have done both of the things in this article and in steam preferences, but steam still open at startup. I don’t get it. There is also a stupid checkbox in the Steam preferences pane, that you have to uncheck independent of the “login items” thing. With Steam open, click the Steam menu, and choose Settings.